Tonight in Temple Bar, Dublin. 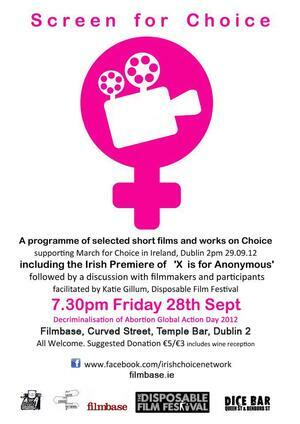 X is for Anonymous was created by three Dublin students – Heather Browning, Kerry Guinan and Rosi Leonard. Born during the era of the X Case, these student filmmakers interrogate why the government have failed in their duty to another generation, and whether the next generation can hope for this much anticipated legislation. The documentary also hopes to describe in some way a particular sense of national identity rooted in religion, and how that identity is often perpetuated at the cost of women’s rights. Key contributors include Senator Ivana Bacik, Professor Fiona de Londras, Frank Crummey, Clare Daly TD, Fiona Hyde, Nadine O’Regan, Katie Gillum as well as a number of pro-choice activists. Posted in Misc and tagged Abortion, March for Choice at 1:19 pm on September 28, 2012 by Ewok.